It's classic and it's also modern, but no conflict, just a nice harmony. That's the feeling Eggthemes Boutiques gives visitors. Black and white, that's classic. Revolution slideshow and visual effect animation, that's modern. Especially, Eggthemes Boutiques is a typical “less is more” with very little details displayed but every details worth its space and mean to serve the purpose of impress visitors. If you want to do business with fashion, from clothes, shoes or accessories, you will need a design like this. 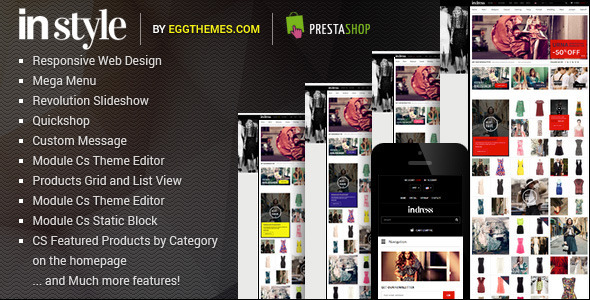 Presthemes proudly introduce one of the finest Prestashop templates for online fashion store – InStyle. Presthemes InStyle has an amazing look which brings visitors exciting feel. And, as the shop owner, you will be surprised with its powerful features. First, Presthemes InStyle is a responsive design that makes you will not need mobile version to make your online store look beautiful in mobile devices. 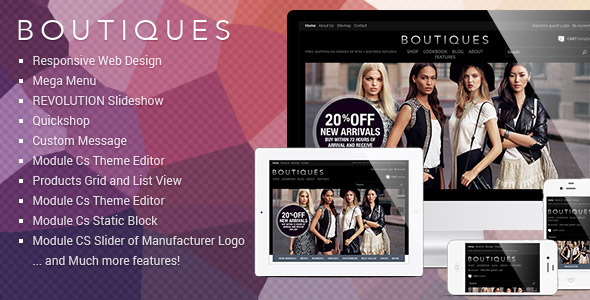 Your site is always perfectly ready for customers to shop anytime, in any device they want. Secondly, there is no more blank, boring background. With InStyle, your site's background can be interesting with image and style. If you want to make it more stylish, Theme Editor feature will be helpful. Free custom color, google font for many elements, two css modes for box and wide, and Products Grid and List view, you are good to go. In terms of feature, Mega Menu Block provides dropdown options, Slideshow with many impressive slider effect, Quickview and one-step Add to cart are all aimed to give your site the foundation to best serve customers and boost the sale. Moreover, you can choose to use the Blog function to support your relationship with customers besides social networks. Still, many other amazing things about Presthemes InStyle for you to explore. So that, either you are planning to open an online store with Prestashop or you are running one but finding the new look and feel for the site, you are at the right place. No like other Prestashop templates, Presthemes Voluthat shines in a very different way. That's the way blocks are creatively arranged and also in how visual effects are applied in each block. Instead of horizontal Mega Menu and a slideshow, Presthemes Voluthat has Menu put in a slide while Promotions and special items are on blocks. Featured products and New collection category are nicely placed at the centre for more attention. Supported Back-to-Top module to allow customers quickly get back to top of the page. Other trendy modules of Prestashop, such as Theme Editor, multi-currency and language, as well as one step Add to cart, are also fully supported. 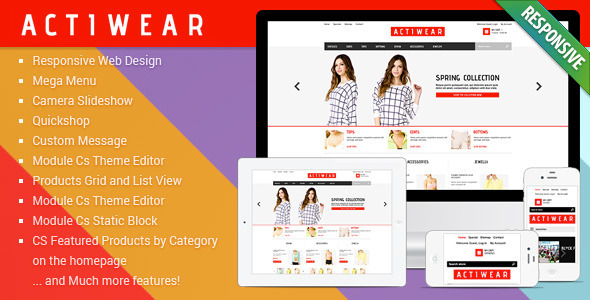 Use Presthemes Voluthat to make your dream online fashion store come true. That's easy! 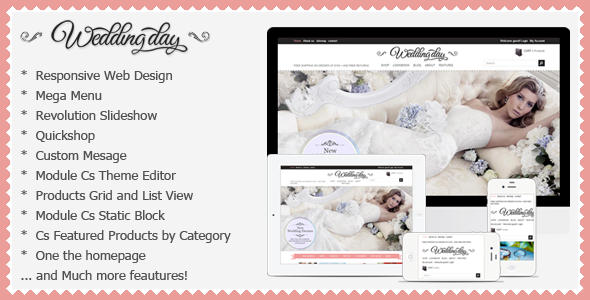 Although it looks simple, WeddingDay still shines every one items in the site with a neat, well-organized layout and creative page structure as well as visual effects. The theme was also featured with a big package of most trendy features and functions for Prestashop templates. Featured products are sorted out in categories, featured categories are displayed under scroll effect and a mega menu is very helpful in guiding customers to their favorite products. A friendly search engine, multiple language and currency are all supported to make sure customers happily and conveniently shop in your store. And, very importantly, Responsive Web Design feature is fully supported in this template and save your money in mobile version for your website.